‘One size fits all’ certainly does not apply to innovators trying to collaborate internationally or establish themselves on new markets. All of them have different prerequisites and goals and thus need tailored support to succeed. Some simply need capital to grow, others have a great innovation, but lack suitable local partners to turn it into a marketable product, others want to expand beyond Sweden and need input on market access. 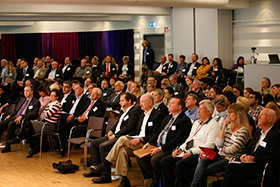 What support can be found in the Swedish innovation ecosystem? Who are the players, what is their USP and how are they contributing to the internationalisation of innovation? Aktiviteten arrangeras av EIT Digital.